If Things Are So Good, Why Are They So Bad? It is a measure of how subdued is the national mood and how modest are our current ambitions that we expect so little of our elected governments. Even nearly four years after our own home-grown recession began, we are, for example, expected to acclaim as a triumph of economic management the first signs of a patchy and fitful recovery that still leaves us well short of 2008 levels. We might have expected much better. We were largely insulated from the direct effects of the global financial crisis. Our two major export markets remained surprisingly buoyant. And we have enjoyed record high commodity prices. Yet, to hear our leaders tell it, even our woes are a sign of success. The soaring kiwi dollar, we are assured, shows that foreign investors see us as a “safe haven” – a claim that sits oddly alongside the repeated warnings about the risk of a credit downgrade and of the need to wind back public spending so as to reduce a rampant government deficit. The truth is that the soaring dollar reflects a conviction on the part of overseas speculators – based on 25 years of experience – that our governments will go on paying them a premium and that the short-term demand for our currency thereby engendered will produce a capital gain as well. This is entirely consistent with the growing evidence that, as the recovery at last manifests itself, we will use the opportunity to repeat the recurrent mistakes of the past 25 years all over again. We will continue to treat any prospect of growth as an inflationary threat, to be knocked on the head by a combination of high interest rates and an overvalued currency. We will continue to express puzzlement as to why – in this policy framework – productivity languishes and our economic performance falls behind that of our competitors. There are occasional flickers of interest in a change of policy. Geoff Simmons, for example, points to the prospect of using tighter rules for bank lending as a counter-inflationary tool and as an alternative to high interest rates. But he also warns that the Reserve Bank – with its single focus on inflation (and it is, after all, a bank) – is unlikely to change course. 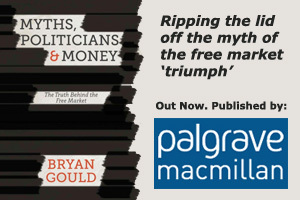 And governments, of course, particularly at this stage of the electoral cycle, may wring their hands at the high dollar, but will secretly welcome the consequently cheaper imports – a short-term advantage that helps to holds down a soaring cost of living through to election day but that is bought at a huge cost to our long-term economic performance. It could be said that these problems are like old friends; they may be a nuisance and somewhat boring, but they are at least predictable, and it is true that there is a certain comfort to be drawn from getting what you expect. A right-of-centre government could be expected, for example, to stick closely to monetarist theory, and to pin its hopes for an improvement in economic performance on tax cuts for the well-off, asset sales, cutting government spending, taking a tough line on benefits, and seeking free-market solutions to most problems. That is exactly of course what we have got and presumably what people voted for. In the past, after giving these measures a fair trial, they have judged that they have not worked and then voted to get rid of them. This time, the policies look like surviving for a little time yet. It is not that the policies are different – merely that the salesman is better. But there is one consequence of current policy that even the most brilliant salesmanship cannot so easily sell to the public. The now unmistakable evidence of rising poverty, with children as the most vulnerable victims, is the inevitable result of widening inequality, higher unemployment, falling real incomes for the poor, less effective public services, and rapidly rising living costs. The myth that families choose poverty as a lifestyle option can only be sustained in a society that is divided – where the well-off are comfortably shielded from the realities of life for the worse-off. One of the advantages of being well-off is that it is possible to buy your way into a better neighbourhood, to go to better schools, to mix with better-off work colleagues and friends. You do not then need to venture into the poorer neighbourhoods, to sit around the table to share inadequate and poor-quality food or to feel the cold and damp in overcrowded bedrooms. You do not feel the humiliation of being rejected for job after job or having to present yourself for close questioning as the condition for receiving a weekly benefit which – in a well-off family – might be entirely spent on a single meal for family and friends at a good restaurant. Individual instances of hungry children might be dismissed as cases of fecklessness and inadequate parenting. But a rising tide of such children, whose health, education and very lives are threatened by hunger, is a social phenomenon with widespread social and economic causes. It might be – indeed, is – a predictable consequence of current policies, but that, surely, does not make it acceptable? Predictability in this case should not produce resignation but rather a clarion call for action. If things are so good, why – for so many of us – are things so bad? This article was published in the NZ Herald on 2 August.